What I love most about interiors is that, in a way, they are works of art and traces of history that you can literally just walk in to. There is so much I love about Italy and Italian culture, I could’t even begin to describe. Especially when it comes to culinary trends and traditions – I am very drawn to their attitude towards food and drinking. Not only, well yes, mainly, because the produce is often of high quality and the dishes are so amazingly tasty, also because of the way it plays an invaluable role in everyday life and how it is often paired with (unplanned) social gatherings and silly habits. Whether starting the day in a caffè with the best coffee imaginable, paired with a sweet cornetto, enjoying a traditionally cooked dinner with the whole family, or having small snacks and bites during aperitivo, food just is culture. Culture, tradition, social matter, and style. When a serious dash of style is added to the mix, I get overly excited. A place where all of these things often come together in a brilliant way, is the Italian coffee bar, or caffè. I’m sharing with you some of my favourite coffee bars around Italy – where you can enjoy a fantastic cup of coffee and sweet treats, in an environment packed with history and style. Starting in the capital, maybe the most spectacular example of a stylish coffee bar is Caffè Canova-Tadolini at Via del Babuino 150 (between the Spanish Steps and Piazza del Popolo). It used to be the studio of two consecutive sculptors in the 19th century (Antonio Canova and his student Adamo Tadolini) and is still filled to the brim with models of sculptures and tools of the masters. It makes for a truly unique coffee experience. The neat outfits of the baristi, the beautiful black marble bar, and the black-and white cups paired with golden spoons form an artwork in its own right. Next to the bar area, there is also a restaurant where you can enjoy your meal while being watched over by mythological and biblical figures. This place is an absolute must-see when you are visiting Rome! Next week I’m taking you a bit further afield to share my secret spot for the best breakfast in Rome. We are celebrating great set design in this new series about films in which interiors play a major part. One of my favourite films of the last decade featuring beautiful interiors is Coco Chanel & Igor Stravinsky by Jan Kounen (2009), adapted from the novel by Chris Greenhalgh. It focuses on Coco Chanel’s alleged love affair with Russian composer Igor Stravinsky, whom she invites to stay in her villa outside Paris, along with his wife and children. The summer months that follow see Chanel and Stravinsky begin an affair, one which Stravinsky’s wife cannot avoid noticing. 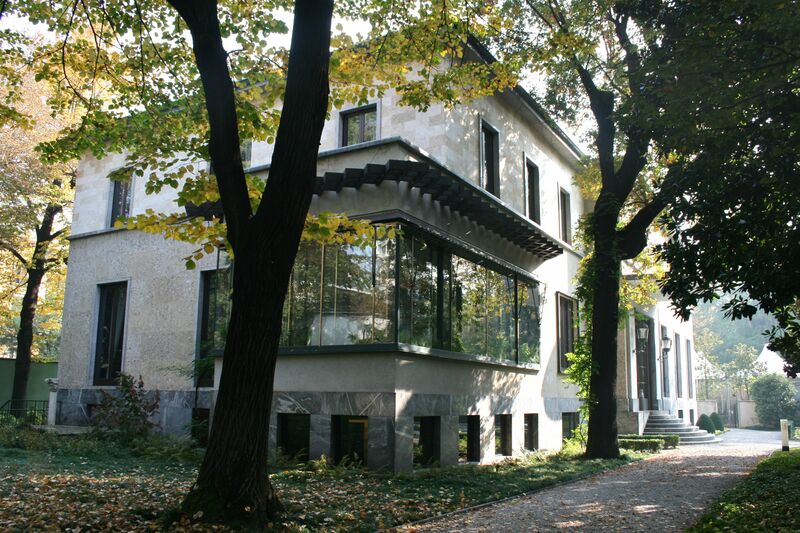 It is quite a bit younger than most other historic homes discussed in this series, but certainly not less impressive or authentic: Villa Necchi Campiglio, an architectural gem tucked away in a quiet, leafy side street in the chaotic city center of Milan. Next time you visit Brussels, skip the Grand Place, Manneken Pis and the Atomium. Be original and head to the neighbourhood of Saint-Gilles instead, to pay a visit to the former house and studio of the famous Art Nouveau architect Victor Horta (1861-1947). In the previous post about the mysterious castle I told you about my first explorations of the building and how I found but a few traces of the oldest periods and some remnants of early 20th century life in there. Today I will focus on some of the surviving 19th century wallpapers that I did research into for the owner of the building. If you had to name one thing that will never go out of style, what would it be? I would go for Persian carpets. They have been produced since ancient times and were popular all throughout history. Earlier this year I was asked to take a look at some historic wallpapers in a castle near my hometown Maastricht. The papers were discovered during a condition survey of the long-neglected building, which is now undergoing structural restoration. I was thrilled to get this assignment, because I had taken a special interest in the castle since a year or so. Today I’m launching my blog History by Design! It’s going to be about great design of all ages: cities, buildings, interiors, furnishings, objects, art, fabrics, colours, patterns… even movies and food. First up is a selection of my favourite 17th century Dutch interior paintings. Interior paintings are my favourite genre. Not only because they give you an idea of what homes looked like in bygone times, but also because of the many different materials, textures, patterns and objects that are often depicted. Also, the play of light in the rooms can be beautiful, the most famous examples of which are the paintings by Vermeer. But as most people probably know those well, I will here discuss some lesser-known interior scenes. In the 17th century domestic scenes were very much in fashion and thus produced en masse. Some painters even specialized in the subject, like Pieter de Hooch and Gerard Dou, who both painted in a very delicate manner, producing paintings with smooth surfaces, intricate details and amazing simulations of different materials and textures.